Father Peter Kountz, Curate of Saint Stephen’s Church in Center City, is a fervent devotee of music. The son of a concert pianist mother and music critic father, he still coaches early music and admits to a musical past which includes playing jazz trumpet. It is no surprise therefore, that in fulfilling the parish’s mission of redefining congregation, he would employ music. Together with his longtime friend, jazz pianist Fred Hersch, Father Peter has launched a concert series entitled The Future of Jazz Piano. Mr. Hersch played the inaugural concert in September and last night the first of his selection of young jazz pianists, Glenn Zaleski, played the second. When Mr. Zaleski played his jazz version of Fredyryk Chopin’s Nocturne, Opus 9, No. 3, he deployed everything in his video on voice leading – from two-note voice leading fitting the natural extension of the hand to his inventive use of ninths, elevenths, and thirteenths. In doing so, he meshes both jazz technique and the ninth, eleventh and thirteenth chords of Chopin’s harmonies. The juxtaposition of jazz and Chopin is thrilling –a true distillation of harmonic thought demonstrating the common genetics of jazz and romantic harmonic structures. Mr. Zaleski listens carefully and is guided more by what he hears than what he has laid out beforehand. When he began his program, he explored the bass sounds, testing the resonance with an audience in the room and reacting to the sounds. He gave “I’m All Smiles” (Michael Leonard) more dissonance and contrapuntal structures than “My Heart Stood Still” (Richard Rogers). He lays down his harmonic structure and then expands it in a stochastic improvisation. At times, Mr. Zaleski played quiet chords with his left hand and crossed over with his right hand to play melodies and embellishments, giving the lead tones a deep, resonant effect. For “In the Wee Small Hours of the Horning” (David Mann), he colored the introductory chords with pedal, creating an impressionistic effect. 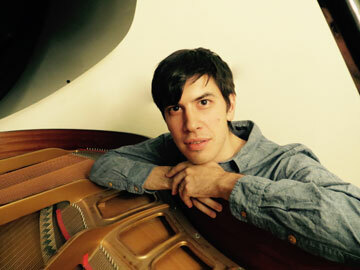 The variety of styles, including sustained trills, staccato bass, prestissimo embellishments, and alternating voices in “The Duke” (Dave Brubeck) to the full, rich chords of his “Chorale,” a quiet lullaby tribute to Fred Hersch, Mr. Zaleski is full of inventive ideas, which seem to flow through his fingers almost unconsciously. His playing will no doubt become more structured as he continues his career, but the joy of his flowing ideas is a pleasure to hear.